In mid-July, Silas got to go on his first plane ride as we headed out to Ontario to visit my (Jason’s) family. He did fairly well, even sleeping on our laps on the ride there. 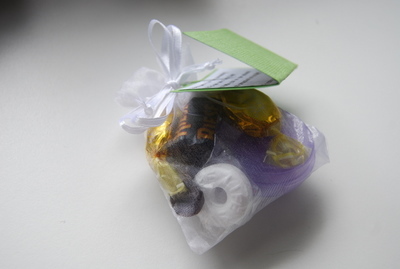 Shannon prepared some little packages including candy, ear-plugs, and a poem apologizing for our crying son to appease our fellow passengers in case Silas got carried away. They were quite well received! Shannon handed these packages out to our fellow passengers. The week and a half we spent in Ontario was a lot of fun. Rather than go camping or do any large, ambitious trips, we spent most of this time hanging around Jason’s parents’ house, enjoying the backyard pool, playing volleyball and soccer, walking around the neighbourhood, battling it out in board games like Settlers, reading, and playing music. 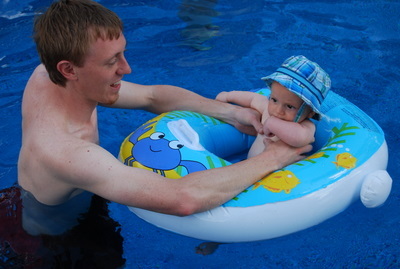 Silas didnt like the cold at first, but eventually got used to the water. 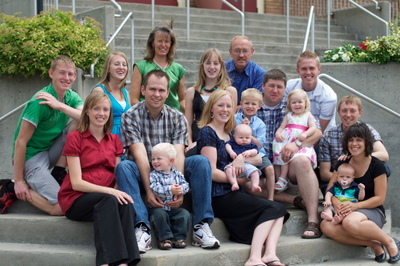 Jason’s parents and two youngest siblings had flown out to BC to visit after Silas was born, but some of his other siblings hadn’t met him yet. It was great fun to introduce him! All his aunts and uncles told us how cute he is, and having so many hands to hold him gave us a nice rest too. Although my niece and nephews are still fairly young, it was fun to begin to watch the cousins of the next generation interact. 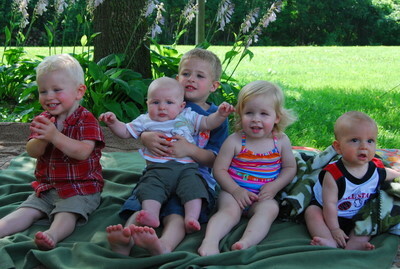 All the cousins lined up for a photo shoot. Thats not an easy task! This entry was posted on Tuesday, August 3rd, 2010 at 11:53 am	and is filed under Life. You can follow any responses to this entry through the RSS 2.0 feed. Both comments and pings are currently closed. Yes, we are very thankful for our growing gang, and pray that relationships will remain strong for years to come, even though we can’t be all together very often. Love you tons! Great idea! Got to file that way the next time we fly on the plane. And I agree with Mary, please do post the poem!